On what is the beauty of natural dyes based? How have synthetic dyestuffs disturbed or even destroyed this palette of colors after breathing into Anatolia more than a hundred years ago? Do we have to return to a pre-scientific era evoking mystic powers of dyeing with plants and beetles — as is nowadays suggested in many booklets dealing with natural dyeing —or do we even have to seek in color the "soul of nature" in order to answer these questions? Dyeing with natural dyestuffs is not an enclave where the laws of nature have no say, and we can find acceptable rational proofs for the superb aesthetic qualities of natural colors. The carpet weaving industry today offers sets of dyestuffs consisting of the three primary dyestuffs only: blue, red, and yellow. Mixing them in pairs in the dye-bath results in the secondary colors violet, orange, and green. Mixing all three primary dyestuffs results either in the color black — if a specific proportion is observed — or in the wide palette of dark tertiary colors such as red- brown, yellow-brown, etc. If you place side-by-side three wool threads, each dyed with one of the modern synthetic primary dyestuffs, the majority of observers will find this combination of the primary colors blue, red, and yellow to be disharmonious and will describe them as loud, atrocious, or aggressive. If, however, you compare three threads that have been dyed with indigo, madder, and onion skins, most observers will feel this combination of indigo blue, madder red, and onion yellow to be harmonious. There are good reasons for this difference in judging the two combinations of blue, red, and yellow. When looking at madder red in sunlight, besides the perception of "red", that of "yellow" is also produced in the brain, and, though less intense, even "blue". We can say the sunlight reflected from madder red does not contain red light only, but yellow and blue light as well (besides containing a large proportion of red, madder red also contains yellow and blue). The same applies to indigo blue and onion yellow. Indigo blue contains an element of red and a small element of yellow; onion yellow contains one of red and a small one of blue. To verify our statement, we return to the experiments with modern synthetic dyestuffs. If you wish to imitate madder red with the three primary dyestuffs that represent almost pure blue, red, and yellow, you have to add yellow dyestuff and a little blue dyestuff to the red dyestuff in the dye bath. The harmony we sense in the combination of madder red, indigo blue, and onion yellow thus stems from the fact that these three colors each contain elements of their neighboring colors within each dye. In other words, we can clearly say: The integration of neighboring colors within each dye has a harmonizing effect; natural colors are already harmonized in and of themselves; the presence of all three primary colors in each natural color brings about a shift towards black that, in its turn, softens the colors intensity. The presence of all three primary colors in indigo blue, for example, does not mean that indigo blue, besides blue dyestuffs, also contains red and yellow ones. Here in particular, one dyestuff, indigo, is responsible for the blue color This one dyestuff on the wool fibers, when exposed to sunlight, reflects not only blue but also red and yellow light. Out of yarn dyed with natural dyes, it is impossible to create color combinations that seem grossly disharmonious, as each color already has neutralizing and softening qualities incorporated within it. On the other hand, modern three-component wool dyes, when used singly because of their molecular structure, yield almost pure colors which lack the qualities of harmonizing and softening. Nevertheless, it is possible to imitate a great number of natural colors by mixing these three synthetic dyestuffs. 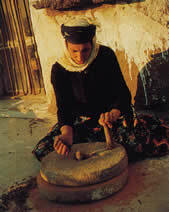 In the villages of Anatolia, however, those mixtures simply are not readily available. It is the grocer of the village who offers a chance selection of dyestuffs — predominantly cheap ones — from all over the world. Few people in any of the villages can read and understand the labels and instructions on the rusty containers — which explains why thousands of carpets woven in Turkey combine wool of superb quality with colors of the utmost ugliness. The marketplace is doing its best to correct or hush up those imperfections; for weeks, village rugs lie exposed to the glittering sun of southern Anatolia, or, to shorten the process, are dipped into corrosive bleaching baths. There are additional reasons why natural colors are so attractive and beautiful. 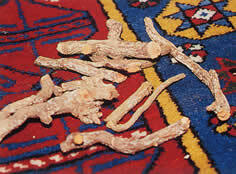 Madder roots contain up to nineteen different dyestuffs. Based on this vast potential for dyestuffs, we can produce a broad and varied spectrum of colors ranging from dark red to orange or, by way of violet, to the dark tertiary colors; it goes without saying that mordants, the composition of the water used, dyeing additives, and the dyeing method itself all play an important role in the process. A hundred different mixtures of synthetic dyestuffs would not suffice to produce this range of madder colors Madder red in itself contains many small shades of color which the eye registers with pleasure. These tones cannot be found in the monotonous red that is produced by one synthetic dyestuff. Besides, in the view of the manufacturer, such shades are not desirable because he regards a consistent monotonous red as a sign of quality. What the synthetic dyes lack is called "abrash"— various shades of color in one field of color, or even in a single knot of wool. Abrash is not necessarily the result of dyeing with various dyestuffs. Abrash can also be produced with a single dyestuff, such as indigo. An indigo-blue knot alone, owing to the particular character of the vat dyeing, may shades that range from light to dark blue. Varying thicknesses and irregularities in the twisting of homespun yarn also cause variations in the intensity of the color In addition, the dyeing process is influenced by differences in the quality, the fiber structure, and the lanolin content of the wool; winter and summer wool, for instance, do not absorb dyestuffs in the same way. 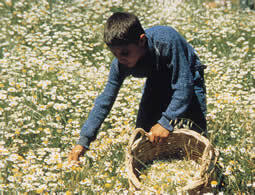 One of the outstanding qualities of natural dyes is that they do not run. Wool dyed red with madder, or blue with indigo, will hardly fade; the light fastness of yellow-dyed wool, however, varies considerably. 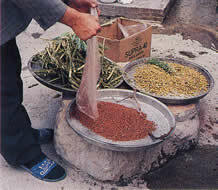 For more information on vegetable dyeing in Anatolia (Turkey) follow this link.